Discover a little piece of Germany across the Ohio River from downtown Cincinnati on this fabulous tour that blends architecture, history, natural beauty, food and drink — for those who want it all! 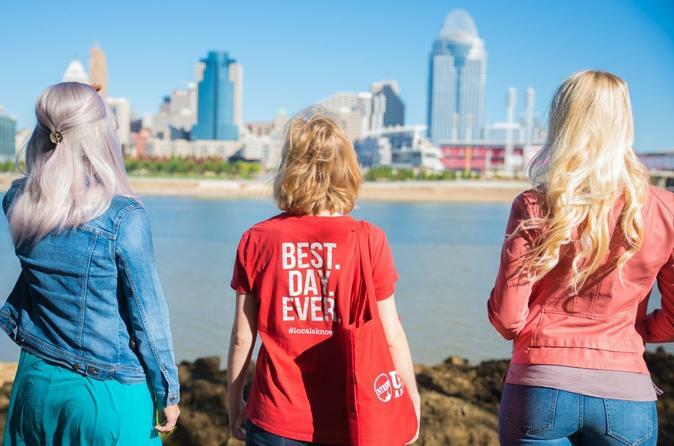 Stroll past stately Civil War era mansions, fill up on tasty pizza and raise a glass to our historic river town before stopping to admire the Cincinnati skyline from a unique perspective. On this whirlwind tour, you’ll begin in Cincinnati at the National Underground Railroad Freedom Center, where a piece of the Berlin Wall stands. After a brief history of the Queen City, you’ll hop on a nostalgic trolley and cross the Ohio River for a one-mile stroll around the Licking Riverside Historic District in Covington, Kentucky. You’ll see majestic homes built in a variety of architectural styles that date back to the 1800s and discover why this area is so very special. The view of Cincinnati’s skyline is especially beautiful from this side of the Ohio River. All aboard the trolley for a short ride to a delightful village called Mainstrasse, which was built largely by German immigrants in the 19th century. This eclectic community is filled with enticing retail shops, bars, restaurants, and two parks, one of which features a 100-foot tall German Gothic clock tower. This area also features the Goose Girl fountain, which is sure to delight you! We’ll stop at one of our favorite local eateries to indulge in some yummy pizza while sipping your choice of a craft beer, glass of wine or soft drink. Hopefully, you have a sweet tooth because we aim to satisfy it at a local cafe with a waffle cone blended with up to three ice-cream flavors of your choice (and there are 67 awesome flavors available for your delectation!). Our tour will end here, but don’t worry; you’re free to explore the village at your leisure and then return to the trolley stop for the fun ride back to Cincinnati. Before you go, don’t forget to ask your local guide for tips on what else there is to see, do and eat in our buzzing city.